But back to the story of that cherished day. I have already shared it on my social media accounts but thought that it needed to be written down and published on the blog. Saturday morning, November 3. Joey had been in Bacolod for six days already and was due to fly back to Manila that evening. I missed him and was looking forward to his arrival, but I completely understood why he needed to go, anyone would - his father, my father-in-law, Dan Ramirez, unexpectedly passed away the previous Saturday, October 27. The family was stricken with grief.. I wanted to go and grieve with him but I wasn’t allowed to anymore because I was already in my 35th week. It is unspeakably sad how Daddy Dan and Lilibubs never got to meet each other.. But as Joey and I talked about the timing of everything, I realised that our Lilibubs wasn’t just a gift for me and Joey, her very life was also to ease the pain of the family. Our Heavenly Father, in His perfect plan, knew that He was gonna call Daddy Dan home, and to soften the blow of his death, He gave us Lilibubs a week and a day after to help deal with the loss somehow. 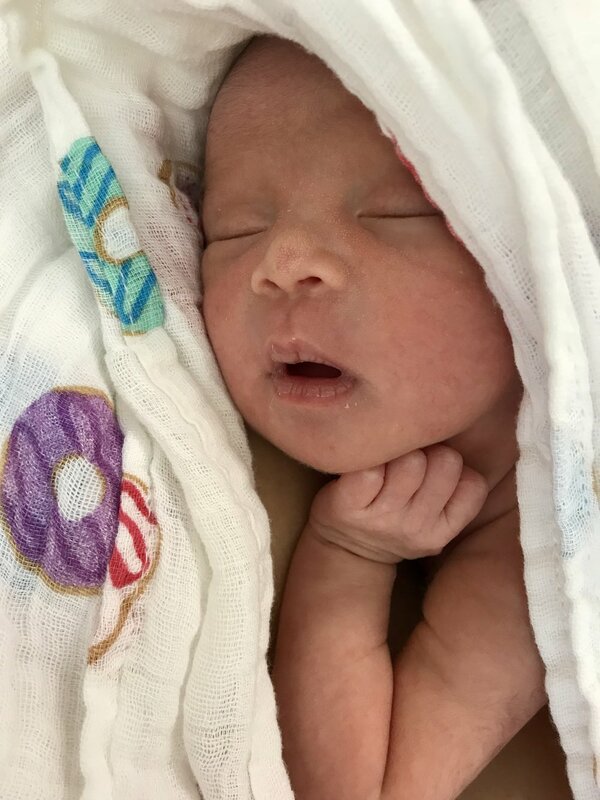 Our beautiful firstborn, Issiah Dañelle aka Lilibubs. I kinda felt that she was arriving soon because that morning, she woke me up with such very strong kicks. I thought she was just excited that her Daddy was coming home. Accompanied by my mom, uncle, and brother, I went to Asian Hospital to see my OB, Dr. Eileen Manalo, for our regular weekly checkup. Little did I know na dire-diretso na yun. My checkup went well, though Dra had some misgivings about my amniotic fluid. She advised me to go for a non-stress test again that afternoon, and to see her again the following day to monitor my fluid. She also asked me to increase my water intake. My family and I had a light, easy lunch in the hospital. I went up to Genesis after for the NST. Almost immediately, I started having contractions. The real, labor ones that I’ve never felt before. It was educational, to say the least, as finally I understood what the real ones felt and how they differed from the Braxton-Hicks contractions I knew I’ve been experiencing. Lilibubs was born so small I knew my job for the first few weeks was to fatten her up. The contractions came as close as four minutes apart. Upon my OB’s instruction, nurses administered drugs to relax my uterus intravenously, while keeping me hooked to a monitor for 24 hours’ observation. I was alone in the room as I asked my family to go home to prepare my things just in case I delivered early (good thing I’ve already packed my hospital bag!) and to pick Joey up from the airport. Joey. I called and told him where I was and I could hear the panic in his voice. I could hear our silent prayers asking God to wait until he was with me before I delivered. He was in Manila when my father-in-law died in their hometown, Bacolod.. I did not even want to imagine how he would feel if he wasn’t there when Lilibubs is born. And so we prayed.. and prayed and prayed. Doctors and nurses would come in to check on me periodically. Cervix is still closed, no bleeding.. though on one of the contractions, Lilibubs’ heart rate decelerated so they were keeping a really close eye on me. By late afternoon, contractions have gone and I was allowed to have dinner! I was so happy! I knew that being allowed to eat solid food meant I wouldn’t undergo surgery anytime soon. Joey arrived at around 8pm and I shared the good news with him. Yay! Hindi kami ma-CS that day! Joey getting ready to enter the OR. Contractions were still kept under control the following morning and I was allowed to have breakfast. Again, I thought we were home-free but by mid-morning, contractions started anew and Lilibubs’ heart rate dropped to a very low 100 on one of the tightenings. My cervix was still closed, still no bleeding.. It was decided then that we would undergo an emergency Caesarian section that very day. Our OB didn’t want to risk Lilibubs’ life any more than we do given how low her heart rate has dropped in response to contractions. 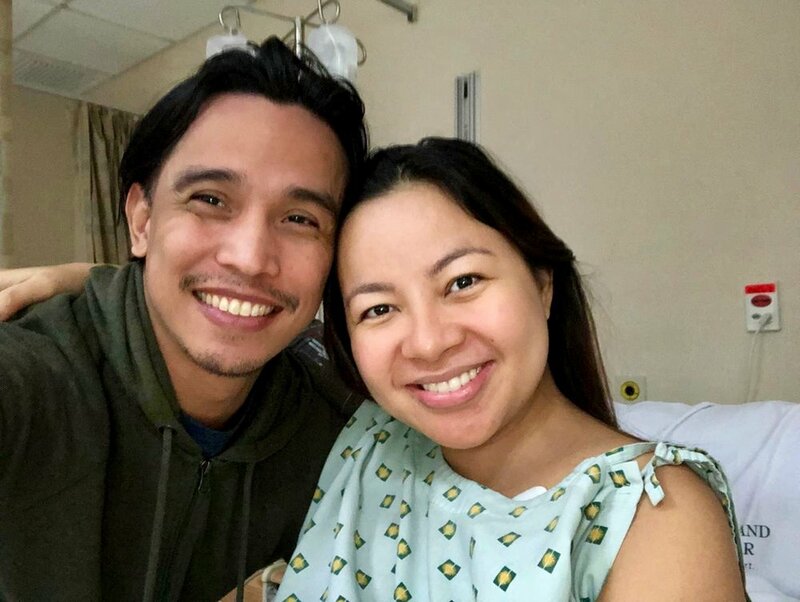 One of the doctors also said that since I was APAS, to reach nearly 37 weeks was a feat in itself, and that again, it is not worth waiting a few more days just so we can say that our baby reached term when clearly she was already in distress. It was probably around 10:30am-ish when our OB dropped in and confirmed the surgery. I knew she had two scheduled IVFs at 11am that day. Additionally, she had to do a cerclage and after that, it’s game time for us, probably at around 12nn, 12:30pm. Joey and I barely had time to register anything before a nurse dropped in to transfuse blood to me, after which the anesthesiologist came by and prepped me. Before we knew it, I was being wheeled in to the OR - but not before Joey and I snuck in one last selfie before we became a family, hehe! The anesthesiologist kept reminding me not to talk too much once I’m cut open so I wouldn’t be colicky after. I was then asked to go into a fetal position as it was time to administer the spinal anesthesia - I think it was at this time when I stopped singing because I have to admit I kinda got scared hahaha! Nurses were using their bodies to help me curl up even more, and when the anesthesiologist was satisfied, in came the needle, down came the blue drapes, and as my lower body slowly started to feel numb, I could feel the assisting doctor begin to sterilise my belly. So, so fast. It seemed like only seconds later when Joey came in, and then I heard Lilibubs’ beautiful, beautiful wail. She was cleaned so quick then laid on my chest for our first skin-to-skin (and first family picture! Hahaha!). She was so pink, with puffy eyes, chubby cheeks and curly hair. Lilibubs a few hours after her birth. Considered premature, she was taken to the NICU for 24 hours’ observation before she was roomed in with us. I couldn’t believe it. Our daughter is here. We have a daughter!! Joey and I are actual parents!! And then she was taken away and I don’t know if I passed out or they induced me to sleep lol! The next moment I came to, the nurses were putting on my binder and I was taken to the recovery room, where I first got acquainted with post-CS pain as I waited for Joey to come. I was wheeled in at around 12:30. Lilibubs was born at 1:03pm. It was like everything happened in warped speed. How grateful I am to the Lord for leading us to that timely decision. Indeed, He was faithful from beginning to end. 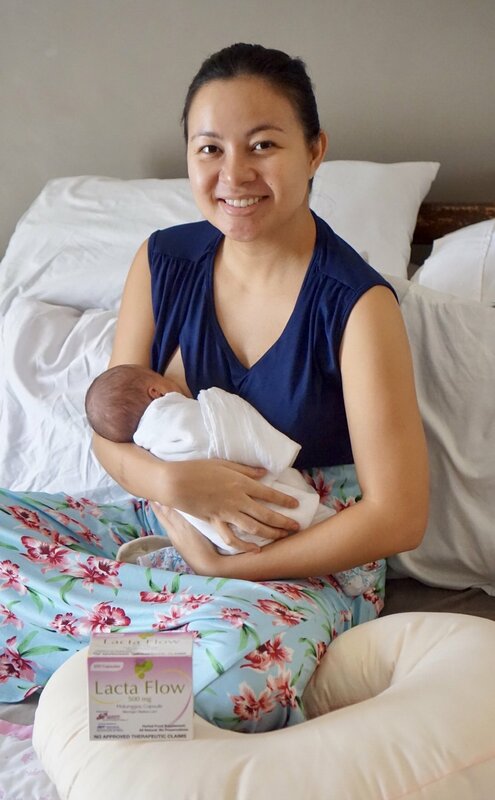 How grateful we are to our meticulous and thorough OB, Dr. Eileen Manalo, who had the foresight to have me tested for APAS before a miscarriage happened, and to our immunologist Dr. CJ Gloria who correctly prescribed what Lilibubs needed to grow. How thankful we are to all who have been praying with us for Lilibubs’ good health and safe delivery. Our miracle child, conceived naturally though I had PCOS, fighting APAS from the very start, small yet feisty, our little warrior princess - she is our cute, living testament of what God has done in our lives albeit the seemingly insurmountable odds. Lilibubs enjoying her burping time a day shy of two weeks. I end this entry with my detailed medical history and my favourite bible verse, the one I clung to in most situations, during my pregnancy and in other aspects of my life as well. May it bring you hope, too. Joey and Lilibubs yesterday, when she turned two weeks old.